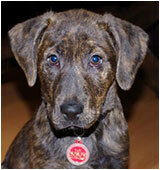 Meet Yadi Coen, an adorable 4.5 year old labrador/hound mix. Owner Matt says Yadi is looking forward to summer. He likes to stroll Downtown and cool off with some Sweet Cow ice cream. Favorite flavor? Vanilla. Say hi to Yadi and Matt when you see them! This house was the site of the Allera residence and grocery store, then a residence and doctor’s office used by 3 different physicians and one chiropractor. Due to alterations and additions, the date of construction is difficult to determine. 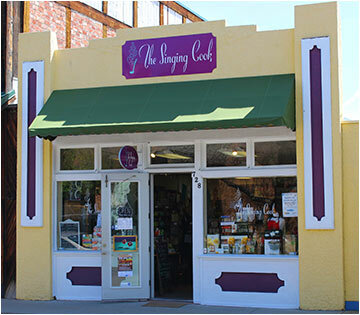 Saturday mornings are filled with fresh local food from the farm and all kinds of specialty items and artsy crafts. Stroll downtown and listen to music under the Pavilion, enjoy breakfast treats and say hi to your neighbors! 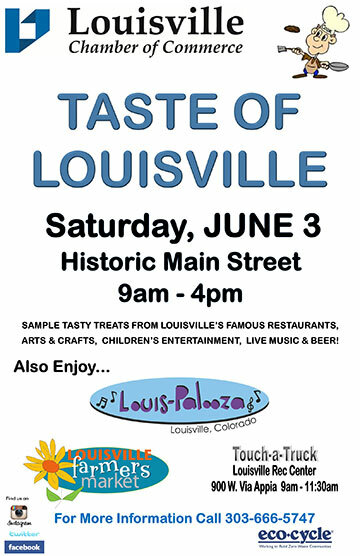 This weekend the Taste of Louisville, next weekend the Street Faire. Welcome to Summer in the City! Louisville Art Association is pleased to announce that it has organized many wonderful artists and crafters for the Taste of Louisville. Be sure to come and check them out. Also check out all of LAA’s workshops, and special programs like portrait painting, open studio, and Plein air that are open to the public. 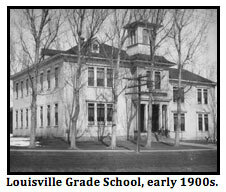 Visit www.louisvilleart.org. 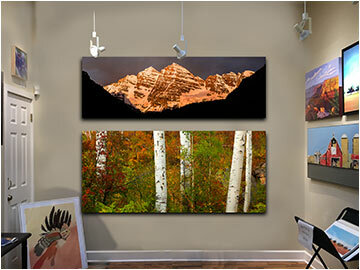 The Gallery is now presenting fine art photography by Lazar Gintchin. Come see his work and the work of other fine artists during First Friday Art Walk. Now’s your chance to hear the Singing Cook SING! Drop by the store for goodies, refreshments and lots of fun on First Friday Art Walk. Music starts at 6:30 pm. Want a quick, easy and delicious lunch? Now you can get it at The Empire, from snacks to salads to sandwiches. 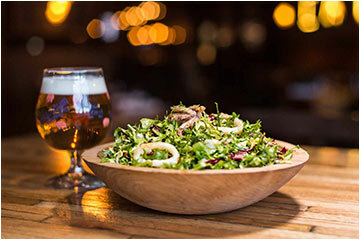 The menu includes Empire signatures like Deviled Eggs, Calamari Salad, Shaved Brussels Sprouts Salad, and of course the famous Empire Burger. Hungry yet? Are you looking to kick-start or restart a running practice? This workshop, will work on running and breathing techniques, and yoga postures to help strengthen and stretch running-oriented muscle groups. Start with a review of running and breathing techniques and then head out for 2-3 miles on the Coal Creek Trail in Louisville. The run will be followed by a yoga flow designed to focus strengthening and stretching the primary muscles used during running. This series is for all levels and costs $35 for both classes, $20 for a single class. 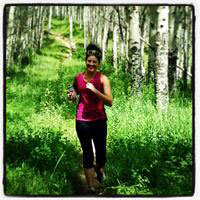 The class meets at Community Park for a run; yoga will be at Yoga Junction afterward. Read books and create felted book bags through knitting or crochet. 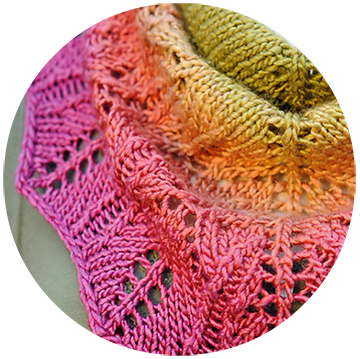 You can officially sign up via Fingerplay’s Ravelry forum thread. Patterns are available in the forum. Books are announced at the Yarning Happy Hour, Friday, June 9. COLOR CONTEST WITH HUE LOCO: Create an exclusive Hue Loco colorway!! Submit a photo to inspire Nicole Clark of Hue Loco in creating a custom color for FingerPlay Studio. Post your photo by June 17 on the Ravelry forum thread. Crayons to Calculators is back, launching this month and running through July. Keep your eyes out for IOE’s community collection boxes around town. They are collecting school supplies and backpacks to be distributed to BVSD students and expect to stuff over 10,000 backpacks. Join them in this tremendous effort by either contributing supplies via the community drive location sites or volunteering over the summer to help stuff the backpacks! 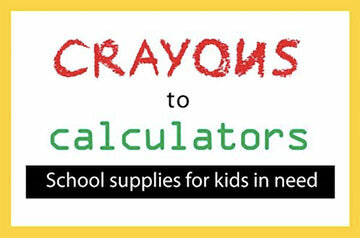 Visit www.crayonstocalculators.org for more information on supply donation location and volunteering. “Build a Better World” is the theme for this year’s Summer Reading Program. There isn’t a better place to celebrate this theme than at the Louisville Library, where everyone is welcome! There are programs for children of all ages, teens, and adults. Have fun reading with the Library this summer and win free prizes, too! Online registration is available now. Program details are available in the Library and on the Library website. Creating a spending plan and having emergency savings are the foundational elements of financial stability. Whether you are just getting started or need some fresh ideas and tricks, this class will encourage and empower you to succeed at saving and budgeting. Money Matters features a different topic each month. “On The Same Page” will launch its 7th year on June 1st with the announcement of this year’s title selection. Copies of the book are available at the Lafayette and Louisville libraries. Program information is available in the libraries and on the library websites. Book discussions and programs take place in September and October, giving members of the community time to read the book and get friends and family members to read it, too! Using historic photos as comparisons, Diane Marino will lead this walking tour to look at Old Town churches and schools. Suggested donation: $5 per person. Louisville Historic Preservation Planner Lauren Trice will look at historic buildings downtown that are being used for new purposes. Suggested donation: $5 per person.